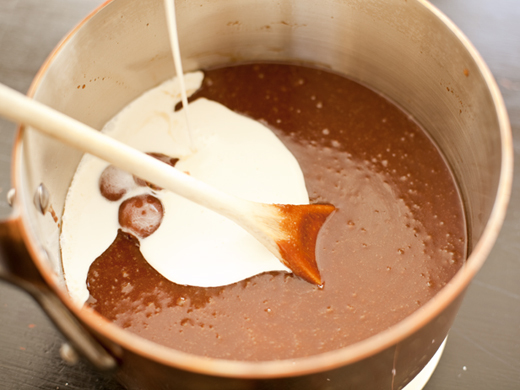 Stir the buttermilk into the cream and let sit at room temperature for 8 hours or until thick. Refrigerate. Can be made a few days ahead. 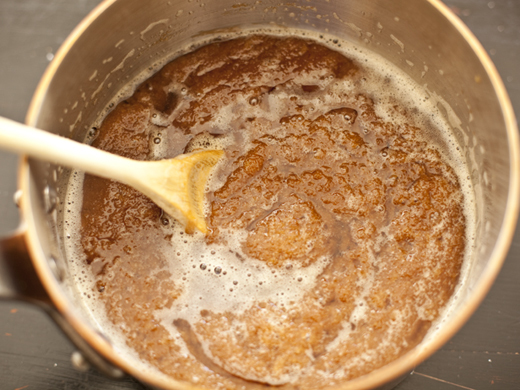 In a medium sized heavy-bottomed sauce pot, cook the butter and brown sugar together over medium heat. Stir with a wooden spoon or carefully whisk (be sure to use the right kind of whisk (Egg Whisk ) or the sugar will get caught in the wires). 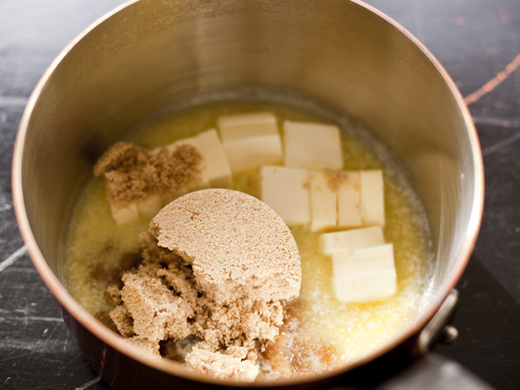 The sugar and butter will separate at first, but as the sugar melts it will become easier to blend them together. Cook and stir until the sugar melts and the butter/sugar mixture just starts to brown, it will start to smoke slightly as well. Slowly add the cream, one cup at a time. It will sputter and sieze up as you add the cold cream. 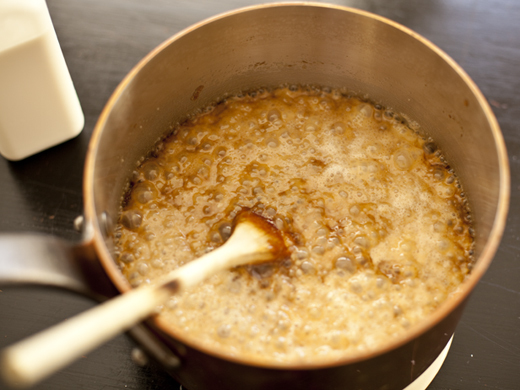 Cook the butterscotch until the seized sugar dissolves again. Add the rest of the cream, vanilla bean and salt. In a bowl, whisk together the egg yolks. 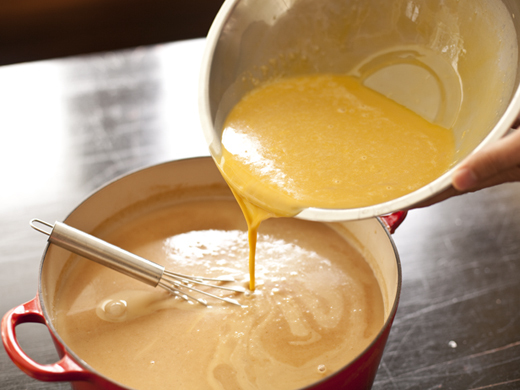 Slowly add some of the hot butterscotch-cream to the yolks as you whisk them. You are just adding enough of the warm cream to warm the yolks slightly. 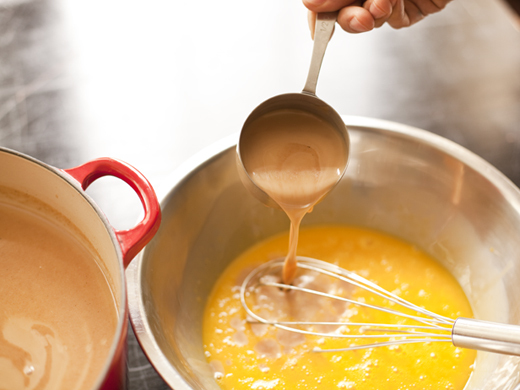 Once the yolks are warm to the touch, pour the yolks back into the pot of hot butterscotch-cream and gently whisk. To bake the custard: Preheat the oven to 325°F. Divide the custard into the eight 4-ounce ramekins. Place them in a water batch and tent with foil. It is important that the water in the pan is hot and comes half way up the side of the ramekins, so that it will reach oven temperature quickly. Using cool water will prevent them from baking evenly. 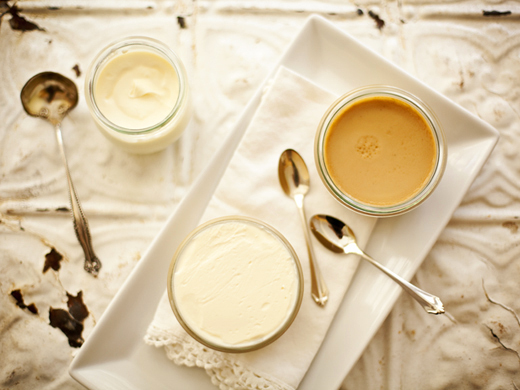 To serve the butterscotch pot de crème: Spread a thin layer of unsweetened crème fraîche over the top of the custard. I like the contrast of the unsweetened crème fraiche and the sweet pudding, but you can add a touch of sugar if it is too stark for your taste. Or serve it with nothing at all. *For a pumpkin version of this just substitute one cup of the heavy cream with 1 1/4 cups pumpkin puree and add 1 teaspoon pumpkin pie spice. Add the pumpkin and spice after you have added all the yolks and cream to the mixture. I have been looking for a recipe like this since i had something similar in Denver. Next time I make a pavlova and have all those egg yolks left over, I’m doing this. I’ve had this at Tilia, and I was so stupidly excited to see you sharing it. Love. These look fabulous and I have just an occasion to make them for. One quick question though. You mention to bake them 25 to 40 minutes. What are we looking for to know they are finished because you also mention not over baking them or they’ll be too eggy/stringy? Is it like a cheesecake where you are looking for it to be “set”? My very favorite dessert. Can’t wait to try out your recipe! Perfect timing! I was planning on making butterscotch pudding for a friend who has a hankering for the sweet treat and wasn’t sure what recipe to use. It will be a fun surprise for her tomorrow! Thanks! Mmm what a fabulous dessert! That looks way beyond awesome,Zoe! YUM! Oh, how FANTASTIC!! I have two recurring dreams since moving far away from Tilia, where I used to be able to walk 4 blocks anytime I had a hankering! The grilled shrimp with peas and fermented bean sauce and YOUR Pot de Crème! I may just have to make a big bucket of it and pretend I am sitting there with you! I’ve luxuriated with this dessert at Tilia and will actually try the recipe myself. As always, great recipe and awesome photography! Thanks for sharing it Zoe! I`ll make it soon. I love this dessert! I’d also love to know where you got the containers you baked/served them in pictures above? Thanks for sharing, Zoe! Pretty sure we’ll be enjoying these little gems in our house very soon! Love. Thanks, I hope you’ll make it to Tilia, it is quite a treat! Zoe, these are delicious!! i made them yesterday for my daughter who loves caramel. From the leftover whites, i made financiers. Not knowing that i was baking, she stopped at Payard’s bakery and picked up four mini desserts for the family. And with all those to sample from, these pot de cremes were everybody’s favorite. Thanks for sharing the recipe. i will post the Turkish version with a link to your beautiful blog in a couple of days in in my blog. I would love to see your Turkish version! Pudding or not, your recipe sounds absolutely delish, and I have to try it. Besides, I just learned from your post that butterscotch is made of butter and brown sugar (and not from some mysterious, possibly alcoholic ingredients as I had assumed before 🙂 ). So even more reason to make it! And the photo looks gorgeous – love that yellowish color – so happy! I hope you don’t mind if I pin it on Pinterest as a reminder. The pictures are very beautiful!And even though I have a major sweet tooth,and hence all desserts are a treat to my taste buds,butterscotch is one of my favorites! I am bookmarking/noting this recipe down. 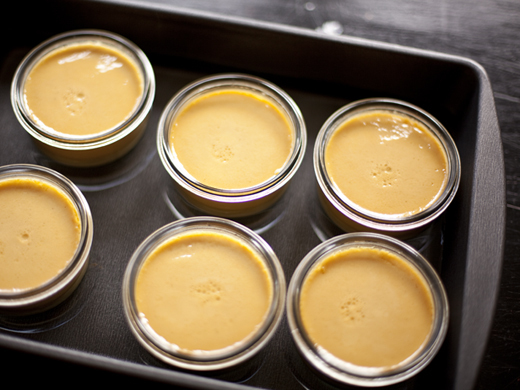 I have been experimenting with my first creme brulees and custards since the first of this year…and loving it. Your butterscotch version is incredibly beautiful, and I’m thinking I need to make another trip to Tilia, if only to order this! Oh, dear! I can’t have sweets – doctor’s orders… But I can still feast on your beautifully executed photos!!! It just makes me wonder how come the photos in your blog are better than the photos in Artisan bread book? Love your recipes! Love your approach to food! Just wish my health would allow me to indulge in such delicious things! Thank you so much for the amazing recipe. I can’t wait to try it! I saw an earlier commenter asking this, but don’t see the answer. Would you mind letting us know how we tell when it has baked long enough? I would sure hate to ruin this amazing dessert by messing up the baking time. Again, thanks for the recipe! I just added some details to the baking instructions that I think will help. Please let me know if this still doesn’t seem clear. That makes perfect sense Zoe. Thanks for the update, and thanks again for the recipe! thanks for the recipe. i had this at Tilia last summer and it was fantastic! I made these yesterday and they were fabulous! We didn’t use any topping at all, it was so wonderful by itself. My mom thought that the taste was exactly like a burnt sugar frosting that my grandma used to make for her spice cake. So at our house these will be known as Burnt Sugar Pots de Creme. Thanks for the great recipe and memory! Hi Zoe:) Im a long time lover of your blog and recipes – I saw this one a couple of nights ago and couldnt wait to make it – your instructions were so perfect and they turned out AMAZING. Like silky smooth cream – unbelieveable. Thanks soo much:) Just bought your Artisan bread book last week – cant WAIT to get stuck into it! Thank you for trying the recipe, so glad you liked it! And, thanks for picking up the book. I hope you enjoy all the bread you bake! I’ve only tried crème brûlée once and I couldn’t get the sugar hot enough to caramelise, so this looks perfect! I’m a little nervous about the smoking caramel (I live in a studio with a smoke alarm a metre away from my hobs) but they look easy enough. You have no idea how excited I was to find this. When my boyfriend and I went to Tilia, he about died over this dessert. This is literally one of his favorite things he’s ever eaten, and I am SO excited to make these for him! I’m going to make them as a Valentine’s Day surprise! My mom loves butterscotch and I would love to make this for her. But is there any way I can print out the recipe without (your beautiful) photos? I love looking at these pictures, but printing them out means many pages of paper and ink. Thanks! The only way to do it, is to copy the post and put it in Word, then errase the pictures. Sorry, I am working on a better printing option. Can these be frozen? If so, how long will they keep frozen if covered? You can’t freeze custard or it “breaks” or separates and doesn’t have the smooth texture. The only way to freeze custard is to churn it into ice cream. Can you please tell me where you can buy the ramekins? Thank you! Hi Zoë, these look so delicious, I can’t wait to try them. Just wondering– do you think this recipe could successfully be halved? Yes, it will work just as well if you make half the recipe. Yes, you can cut the recipe in half. I love this dessert at tilia, so much! We just got it wih a take out order and my almost 2 year old devoured his portion faster than he’s ever eaten anything. I am so thrilled you have posted this recipe online with such great instructions…I’m thinking i might have to make this in place of birthday cake! yet the photo shows much more. Is this a typo or what? I was making a giant batch for a photo shoot, so sorry for the confusion. The recipe is correct as written. I have to say, mine turned out better than the one I odered at Tilia. 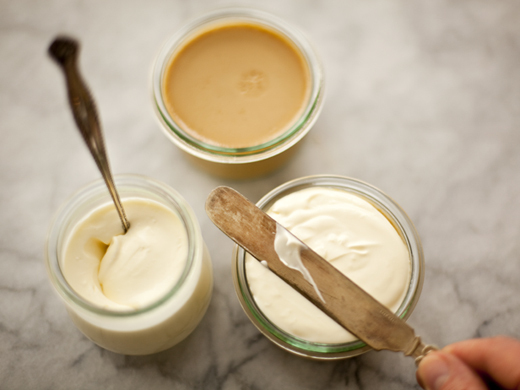 The butterscotch creme seemed richer and I used better creme fraiche – theirs reminded me of goat cheese. I always struggle with the straining part of these things. 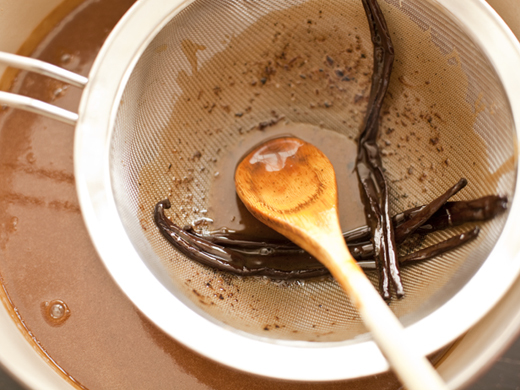 Are you using just a standard mesh strainer? This is the perfect addition to my “deconstructed pie bar” where I serve this along with your amazing lemon curd, whipped cream, creme fraiche, cocowhip (the best product ever), fresh berries and rhubarb w/thyme and champagne compote, and organic white peaches mascerated with Jamaican rum and turbidino sugar with my little signature pie crust tortilla chips for dipping. You inspire me Zoe! You are simply the best! I Will try it here in my Brazilian kitchen! I’ve made these custards twice, and my friends and family loved them…even my sister who doesn’t “like” custard. 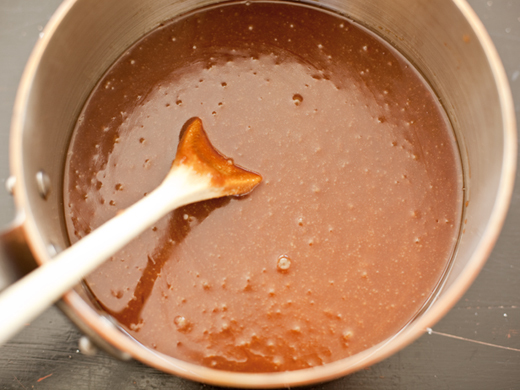 I replaced the brown sugar with sucanat for a healthier version and it also adds to the caramel flavor. So thanks for the awesome recipe! Does it matter if I used low fat buttermilk or full fat buttermilk?